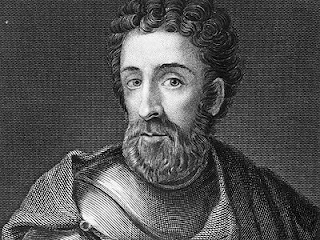 Sir William Wallace was born around the year AD 1272 as a minor member of the Scottish nobility. In 1286, King Alexander III of Scotland died after falling off his horse. Margaret, Maid of Norway, was the heir to the throne, but she became sick while on the voyage from Norway and died in Orkney. The lack of an heir led to "the Great Cause", a period of time in which several families claimed to be heir to the throne. With the threat of civil war, the Scottish nobility invited King Edward of England to arbitrate, though he insisted on being called Lord Paramount of Scotland. In November of 1292, John Balliol as found to have the strongest claim to the throne. King Edward reversed the rulings and summoned King John Balliol to stand before the English court as a common plaintiff. When Balliol refused, Edward stormed Berwick-upon-Tweed, a Scottish border town, defeating the Scots at the Battle of Dunbar in 1296. Edward forced Balliol to abdicate and instructed the almost 2,000 Scottish nobles to pay homage to the King of England. This attack by Edward began the First War of Scottish Independence. Wallace's first known act of revolt was in 1297, when he assassinated William de Heselrig, an English Sheriff. With the help of William the Hardy, Wallace raided Scone as well. Uprisings had taken place throughout Scotland, but most nobles were forced to submit at Irvine in July of 1297. Wallace and the noble, Andrew Moray, continued to rebel, joining forces in September of 1297 around the time of the siege of Dundee. Wallace and Moray, to put the odds in their favor, abandoned the ideas of chivalric warfare, strength in arms, and knightly combat. Instead, they used opportunistic tactics and strategic use of terrain. Moray and Wallace's first major victory was at the Battle of Stirling Bridge in September of 1297. In this battle, an English army, under the command of John de Warenne, tried to cross to the northern side of the Stirling bridge. The Scottish, waiting on the other side, were easily able to defend the northern side of the bridge from the English infantry. When the cavalry was sent in to aid the infantry, it was unable to get across the bridge due to all the retreating infantry men. When the battle was won,Moray and Wallace took the title of Guardians of the Kingdom of Scotland on behalf of King John Balliol, though Moray died later in 1297. The English attempted to draw Wallace out in the open by invading Edinburgh as well as several strategic castles. Wallace, using hit and run and scorched earth tactics, continued to elude the English until April of 1298 at the Battle of Falkirk. Wallace arranged his men into schiltrons, where they used spears, sharpened stakes,and shields to create a protective shell around them, but Welsh long bowman broke these schiltrons and English cavalry was able to break up groups of Scottish archers. The Scottish had a devastating defeat at the Battle of Falkrik, and even though Wallace survived, he gave up the title of Guardian of Scotland to Robert the Bruce and John Comyn of Badenoch. Wallace continued to play an essential role in the war, attempting to get support from King Philip IV of France as well as from Rome and Norway. Wallace as able to elude the English until August of 1305, when John de Menteith, a Scottish knight loyal to Edward, turned Wallace over the English soldiers. Wallace was brought to London, where he was tired for treason. Wallace, in response to the charges, said, "I could not be a traitor to Edward, for I was never his subject," implying that John Balliol was still Wallace's king. On August 1305, Wallace was stripped naked, dragged through London by a horse, then was hanged, drawn and quartered, and beheaded. His head as put on a pike on London Bridge. In 1328, the Treaty of Edinburgh-Northampton was signed, which ended the First Scottish War for Independence, established Scotland as a fully independent nation, and put Robert the Bruce on the throne of Scotland. William Wallace is on our list of important people because he was the victor, but not the victor. Like Joan of Arc, Wallace did not get to see the fruit of his labor and was even killed for his cause, but he stood up for his cause when nobody else could and played an essential role in the War of Scottish Independence.